Ultra protection for athletes with braces. The Ultra Braces Flavor Fusion mouthguard outperforms conventional mouthguards through the genius combination of adjustability and durability in one package. The Insta-Fit Plus™ system allows athletes to mold and remold the mouthguard as teeth continue to adjust throughout orthodontic treatment. 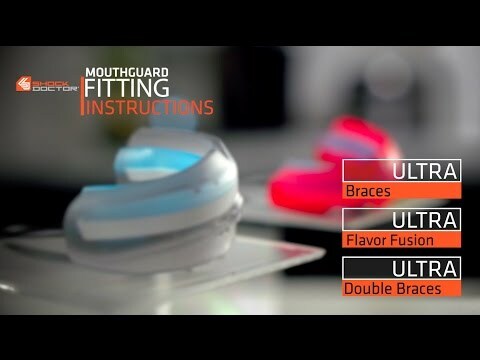 Ultra Braces Flavor Fusion Mouthguard is rated 4.5 out of 5 by 2. Rated 5 out of 5 by Anonymous from Good braces mouthguard This guard fits tighter than the regular braces mouthguard. You have to boil it like a non braces mouthguard when you first get it and you have to boil it again after your teeth move and you feel like it doesn't fit right. I like it better than the regular braces mouthguard even though its more work. It doesn't move as much when its in because your teeth and braces are kind of stuck up in it so its easier to talk too. Rated 4 out of 5 by T.O.Momof2 from Works well It took a little to get used to it, but now wears it for all phys ed. The only comment i would make is that you could make a mint flavored product. We are very sensitive to flavors, and the berry taste was the biggest hurdle.